The goal is to match the larger image with the correct smaller image. First tap the large image in the middle of the screen then tap the matching smaller image above or to the side of the bigger image. There is a timer at the bottom of the bigger image and if you do not make a match quick enough the bigger image will change to another image. The faster you make the match the more points you will score. There are also three special big images that come up. 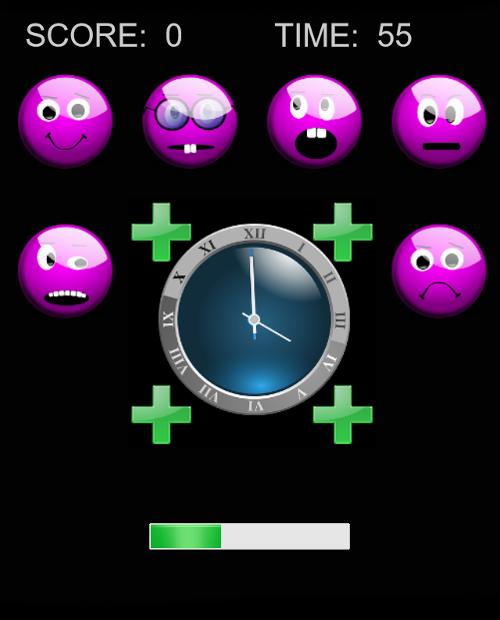 One (with a clock surrounded by plus symbols) gives an increase in the time remaining in the game, another (with a clock surrounded by minus symbols) takes away from the time remaining in the game and a third (which is a bomb) subtracts 25 points from your score. These special images are activated by clicking on them without clicking on any other small image. The game lasts for one minute (plus or minus any time changes earned in the game) and your score and the time left are displayed at the top. Screenshot 1 (not to scale) - click on photo for full view. Screenshot 2 (not to scale) - click on photo for full view. Screenshot 3 (not to scale) - click on photo for full view. Screenshot 4 (not to scale) - click on photo for full view.